Kaiser Permanente has implemented the largest nongovernmental electronic health record in the world, serving more than 8.6 million Kaiser Permanente members. Called KP HealthConnect, its impact on patient care outcomes, efficiency, safety, and patient engagement and satisfaction already is of intense interest throughout the health care industry. 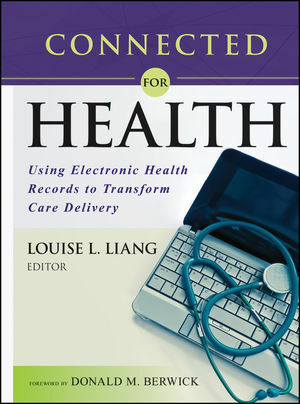 In this volume, Louise L. Liang, MD, who led the massive KP HealthConnect implementation, collects lessons learned from the organization's successful deployment strategy and highlights ways in which the new technological tools are changing and improving - the health care provided to patients and the operations and culture of the organization. "Health care transformation requires leadership and innovation. Connected for Health clearly shows there is no shortage of either at Kaiser Permanente. This is a must read for policy makers and practitioners as the lessons are of critical value if we are to achieve quality, affordable care for Americans." "Connected for Health shares what Kaiser Permanente has learned so far in tapping the vast potential of electronic health records to improve care and expand the frontiers of medical research. It is a journey that should be of great interest to policy leaders in the United States and around the world." "This book is destined to become an important part of the critical dialogue on what reforming our health care system really means." "Connected for Health shows how KP HealthConnect is facilitating great team-based care, getting quality right every time, getting patients activated, and freeing caregivers to connect as true healers with their patients." "Effective implementation and use of health information technology is critical to improving the quality, safety, and affordability of health care. This book provides a great opportunity for others to learn from Kaiser Permanente's pioneering efforts." Louise L. Liang, MD, serves as an executive consultant to Kaiser Foundation Health Plan and speaks, writes, and consults on a broad set of health care issues including electronic information systems, quality, safety, service, and practice redesign. From 2002 to 2009, she served as senior vice president, Quality and Clinical Systems Support, Kaiser Foundation Health Plan and Kaiser Foundation Hospitals, Inc. Working with leaders throughout Kaiser Permanente, she oversaw the national quality agenda to ensure that members received excellent care and service. She led the development and implementation of Kaiser Permanente HealthConnect, a $4 billion-plus organizationwide electronic health record and administrative system to support continuity and quality of care as well as efficient business functions. From 2000 to 2002, Dr. Liang served as chair, Board of Directors, Institute for Healthcare Improvement. From 1997 to 2001, she served as the chief operating officer and medical director of Group Health Cooperative in Seattle, Prior to that, Dr. Liang was associate medical director at the Harvard Community Health Plan in Boston, where she was responsible for health center operations. SECTION I: SETTING THE COURSE. 1 Opportunity and Strategic Leadership (Louise L. Liang). SECTION II: LAYING THE TRACKS. 2 Implementation through Collaboration (Donna Deckard and Pamela Hudson). 3 Physician Leadership and Engagement (Andrew M. Wiesenthal). 4 Nursing Leadership and Impact (Marilyn P. Chow and Valerie Fong). Case Study: Deploying KP HealthConnect in Colorado (John H. Cochran). 5 Making It Matter: Value and Quality (Terhilda Garrido and Alide Chase). 6 Managing the Health of Populations (Louise L. Liang, Robert Unitan, and Jed Weissberg). 7 Redesigning Primary Care with KP HealthConnect (Ruth Brentari and Leslie Francis). 8 Making Health Personal (Kate Christensen and Anna-Lisa Silvestre). 9 Improving Patient Safety (Douglas Bonacum). 10 Supercharging Research through KP HealthConnect (Mary L. Durham). 11 KP HealthConnect and the Archimedes Model (David M. Eddy). 12 The Digital Transformation of Health Care (George C. Halvorson).